NATIONAL Vendor Declarations (NVDs) are a key tool underpinning Australia’s food safety standards, but trade feedback indicates many producers are still failing to fill them out correctly. Non-compliant NVDs have to be amended and re-signed by the producer before cattle can be auctioned or processed, tying up resources for agents and processors and causing disruptions to sales and kill schedules. A system of electronic NVDs (eNVDs) was launched 12 months ago to streamline the NVD process and to improve compliance rates, but, a year on, take up rates have been limited, with only 13 percent of livestock consignments since then accompanied with an eNVD, according to statistics from Meat & Livestock Australia’s Integrity Services Company (ISC). The ISC says it is working with each sector of the supply chain to overcome points of resistance to eNVDs and to improve take-up rates (more in separate story). 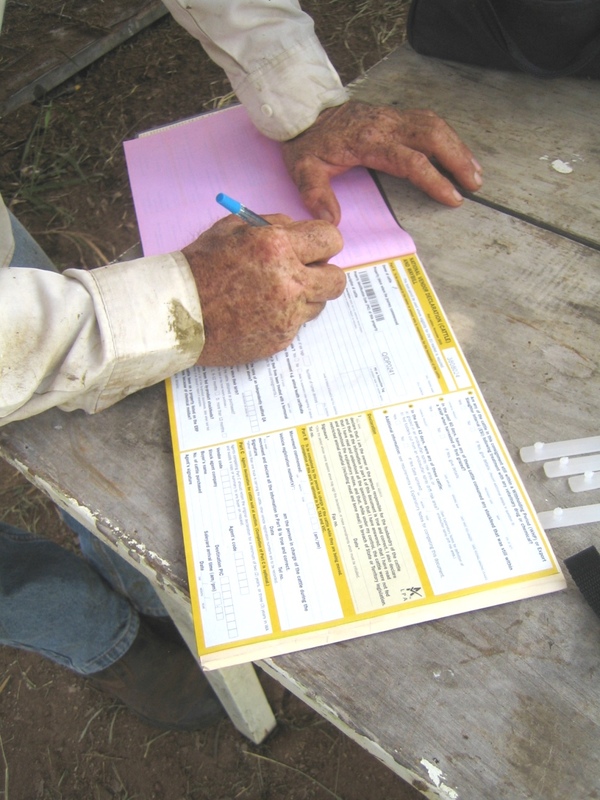 The Livestock Production Assurance (LPA) program requires producers to correctly fill out an NVD when selling livestock, declaring information about the food safety status of the animals being sold. The LPA is a voluntary industry program, however the majority of meat processors require livestock to be sourced from LPA-accredited properties, and will not process animals not accompanied by correctly filled out NVDs (more details frm LPA here). Feedback from agents and processors contacted by Beef Central in recent weeks indicates non-compliance rates remain unacceptably high despite ongoing efforts to make producers aware of their responsibilities. “We’re seeing anecdotal evidence of non-compliant NVDs as high as 30 percent that need to be fixed before sales,” Elders State livestock manager for Queensland, Paul Holm, told Beef Central. “It means having to go back and forth and back and forth (to get NVD’s corrected and re-signed by producers before sale), and it seems to be getting worse and worse,” Mr Holm said. not declaring HGP-status or relevant Withholding Periods or Export Slaughter Intervals, and failing to sign NVDs. Incorrect NVDs meant having to chase down amended paperwork from vendors and, if not able to be fixed, could result in cattle being withheld from auction or a processing shift. “If it is a question relating to the health status we won’t submit cattle without having that corrected, because it jeopardises the integrity of your product,” one processor told Beef Central. The initial reactions of three separate processors to Beef Central’s questions about prevailing NVD compliance rates left little doubt a problem exists: “horrible”, “absolutely terrible” and “the non-compliance rate is absolutely enormous” were their individual answers. One company said it had to employ one person at every plant it operates “just to sort out non-compliant NVDs”. The problem was prevalent from producers at all ends of the scale from small operators to large pastoral companies (while company managers were aware of expectations, problems typically arose from staff in stock camps not filling out paperwork correctly, one processor noted) and small and large feedlots. Cattle Council of Australia president Howard Smith said NVD compliance was an “absolute non-negotiable”. “The LPA NVD underpins our risk management and traceability system, which is one of Australia’s most valuable selling points as a producer of safe, high quality red meat,” Mr Smith said. AgForce Cattle Board vice-president Will Wilson said Australia’s reputation as a reliable supplier of safe red meat to domestic and international markets was built on our ability to trace livestock movements. While no one liked doing paperwork, he urged producers to take the time to ensure NVDs were correctly filled out. “It helps ensure our industry maintains market access and meets food safety requirements,” Mr Wilson said. “There have been measures put in place to streamline the process, improve accuracy and make it simpler for producers, and AgForce will keep pushing for continuous improvements to be made. He said a representative of the MLA Integrity Systems Company attended a recent AgForce attend a forum at Belmont Research Station in Central Queensland to talk to producers about NVDs and how they can comply with the Livestock Production Assurance program. Mr Wilson said AgForce was happy to partner further with MLA and other extension providers to ensure information about NVDs and eNVDs gets out to producers on the ground, and to give producers the opportunity to provide feedback on the current processes. Australia’s livestock traceability and integrity systems are the cornerstone on which Australian red meat is promoted to customers and regulatory bodies both in Australia and around the world. It is vital that the systems in place are appropriate in terms of maintaining the confidence of the industry itself and of wider stakeholders. The NVD helps protect Australia’s international reputation for safe and wholesome red meat products. AMIC supports Livestock Production Assurance as it delivers auditable on farm food safety guidelines, which allow us to guarantee the food safety status of our product domestically and internationally. AMIC supports the NVD as it is an integral tool in protecting Australia’s food safety reputation and product integrity on domestic and international markets. LPA NVDs are voluntary and commercially driven, however AMIC supports the regulatory requirement for NVDs recognised by state authorities. The sheer difficulty of using the electronic NVD continues to raise my blood pressure every time I attempt to do so. Surely someone has it on their radar to direct a few producer levy dollars towards bringing this system up to an acceptable standard for today’s business environment! Ensuring Australia maintains it reputation for producing safe beef is everyone’s responsibility whether you have 3 or 30,000 cattle. We are not just cattle producers, we are food producers and therefore have a responsibility to maintain a good safety QA system, our industry’s continued success relies on it. For years LPA ( including NVDs) has been that QA system, it has provided customers around the world with confidence in Australian beef. Our integrity systems are the envy of other beef producing nations. They open access to markets and maintain that access. It is concerning that those participating in LPA don’t recognise the importance of maintaining food safety through our QA programs, and that they don’t recognise how they underpin both our international trading environment and our domestic consumer confidence . I would encourage all Australian beef producers to take stock of the opportunities our integrity systems offer and embrace them. I can only agree with the extreme disappointment that Howard Smith has raised. In this day and age of consumerism and competing proteins, it is incomprehensible that a producer of any kind of product is not prepared to give his customer a warranty on the product. I know that if you buy a new car or truck or TV you will ask for a manufacturers warranty. Put simply the NVD and LPA is simply our warranty to give our customers confidence that we back the products we supply and sell. To not want to participate at this basic level is an indictment on our production industries. I have been involved with the LPA and the NVD since inception, and am a firm believer in their role in underpinning access for Australian red meat into more than 100 global markets. NVDs are one of our red meat industry’s most important tools. They provide buyers with evidence and information they need to assess the eligibility of livestock for intended targets (eg. whether animals have been treated with HGP’s, whether livestock are still within a with-holding period etc), and provide customers with assurances about the integrity of the product. Access into global markets relies on the accurate competition of NVD’s to ensure both market and customer requirements are being met. NVD’s are complemented with additional checks at processing to ensure the product meets importing country and customer requirements. The integrity of our red meat relies on everyone through the supply chain contributing accurate and timely information to allow any potential food safety risks to be managed prior to product arriving in market. The LPA program was designed by a team involving the whole supply chain, including Producers, Feed-lotters, Processors, Caterers, Food Manufacturers, Retailers, and consumers. The total inclusion of all these sectors shows that it has stood the test of time, of at least 20 years now. Lets improve it, not break it and put some of our markets at risk. David do you do the LPA required paperwork on your own property to the letter of the guidelines? Here is a few off the top of my head requirements for an average tick area cattle property in NSW/Qld. All wooden yards are to be tested for DDT residues, if found the yards are to be fenced off and replaced at a different area. Thing is a lot of old dips have been filled in and old yards replaced with steel so you would not know what might have been there in the past. So really all yards should be tested and replaced in a different area regardless. A sensible approach would be manage the risk instead. Use old yards for your cattle work, but do not do things like do long term feeding in them like a feedlot which increases the risk. Chemical use for animals is records to be kept for all chemical use regardless of whether said chemical has an ESI or WHP. This is to include batch number and expiry date. Unknown why batch number and expiry date records are required, nor why records for non WHP/ESI chemicals is required. Common sense would be a requirement to record chemical use of animals where an ESI or WHP is present if those animals are destined to be sold at a later date. If your property has never ever sold calves then logic would say no need to keep records for something like tri solfen when used on them (90 day WHP from memory). Herbicide use in paddocks, all areas sprayed including spot spraying is to be recorded on a property map, including date, amount used, herbicide used, batch number, this also includes herbicides with no ESI or WHP. Again no idea why a record requirement for chemicals with no WHP or ESI, it makes no sense and just adds to the paperwork. A sensible answer would be keep records for chemical use that has a WHP or ESI. Under the latest biosecurity requirements no piece of mechanical equipment is to be left in a paddock where cattle have access to it. It is to be barricaded off, this is due to potential lead paint contamination, despite the risk being infinitesimally small. Animal Health Declarations and the requirement for a six month list of all chemical treatments of said animals. Why for example would a buyer need to know if five months ago the animals in question got dosed with say Cydectin, which has no WHP or ESI? Commodity Vendor Declarations are required for all imported feeds. I have asked for these and have been met with blank stares to one vendor who said they were only required for organic properties. There are many sensible things under LPA but equally head scratching requirements as well. I think it really needs going through to get rid of the low risk and requirements that simply came out because a book said so. As for market access I believe first and foremost there is a basis of trust from our buyers, who might look at the paperwork, but really trust us to be doing the right thing from a long term relationship. Does anyone here think if say China introduced their own LPA type system and starting exporting beef international buyers of beef would fully 100% trust the Chinese system? Going by all the stories over the years of contaminated food products in China I am not sure I would trust it. But I do trust Australian beef. Agree that it is about time that the other sectors of this industry must stand up and defend the program. Some of these comments are more than a little concerning, if producers believe there are no tangible benefits to Livestock Production Assurance(LPA), we have a serious problem. It is time for the rest of industry to clearly articulate to producers what LPA underpins as far as our export market access goes. There are only limited opportunities for those producers who are not LPA accredited. Ultimately their stock are going to end up at a processing plant, I am led to believe there is only two domestic only plants that will accept non LPA accredited stock, these plants are not AUS-MEAT accredited, so industry has no oversight of these plants. We are an export exposed industry, if at any time we put market access in jeopardy it will have serious ramifications. We are at the point were the market access process seems to be continually moving a far as standards go, we have to defend our auditing process as far maintaining those standards, to say that on farm compliance is at an acceptable standard, yet the paperwork standard is not, shows a lack of understanding as far as how we show compliance to those importing country requirements. We have asked processors regarding the need for LPA accreditation and understand processors do not refuse to accept cattle where the LPA is uncompleted on the form. LPA is voluntary and the eating quality of Australian beef is not improved by filling in forms and wasting time on audits for biosecurity plans that were inadequately completed due to an incompetent roll out. We understand the processors simply pass on the forms to Ausmeat as they do with all other difficult to read or incomplete NVDs. This use of the stick to try to enforce an incompetent system is unprofessional by Integrity Systems and their owners MLA. The problems stems from the system being designed not by practical producers but people who I think must have worked in North Sydney. I could write a long list of things supposed to be done that have no tangible benefit or are so low risk to be not needed. I believe in an LPA type system, just one that is practical, simple and based on evidence and trust, and I am quite sure most producers would agree with that. What we are seeing though is the usual bureaucratic mission creep in this system with some amusing questions. Perhaps it is time an independent review by people forced to do LPA was done to see what works and what does not and throw out the not needed or low risk stuff. The comments are extremely disappointing as a proud beef producer I say if individuals can’t or won’t take responsibility for the integrity and safety of the product they produce, find another profession. This is a whole of industry programme – I am sick of CCA and MLA being the scapegoats -processors,lotfeeders and other beneficiaries should stand up and defend this important program. Howard Smith Mt Panorama Rolleston. Ph 0428 843 264. It is a pity the bureaucrats who design these forms didn’t spend some time out on a cattle property to get some some idea of the processes involved. It takes about 2 minutes to fill out the ordinary NVD, I’ve spent anything up to an hour or more filling out an eNVD, what with passwords etc.that is if the internet does not drop out or whatever. A lot of loading facilities are not handy to a computer and half the people doing the loading out would struggle to use one anyway. When you have a truck at the ramp you need to have him loaded and not mess him around. Just a word on a question on the NVD regarding the feeding of animal fats, no one in northern Australia would tick yes, yet do the bureaucrats know that northern Australia is one big self service with most cattle in the dry season having at least at one time or another feasted on their dead mates. Another possible reason is producers simply can not see the value in the NVD and treat it accordingly. It is essentially part of LPA which from my discussions with producers they can not see the point in that either. LPA is an expansion of the CattleCare scheme of the 1990’s which was voluntary, and producers and processors certainly did not flock to that either. What I would like to see is MLA release statistics of how many audited LPA PICS actually pass the audit properly. I would be surprised if the full compliance rate is above 25%. Not that that means food safety is at risk, it is because LPA is solely about paperwork not what you are actually doing on the ground, it is all about paperwork. So if it turns out proper compliance is quite low, yet there is no proven food safety risk through testing, then it begs the point of the whole scheme in the first place. Why bother forcing something onto people when there are no tangible benefits overall. Can we ask MLA / Integrity Systems to provide NVDs without the LPA logo for those members who elect to opt out of LPA. If LPA is truly voluntary, then, as a service organisation for our industry, it is incumbent upon MLA to provide NVDs for all cattle producers including those who elect to opt out of LPA. As a simple producer, I would assume then that the Japanese beef being imported to Australia has an equivalent paper trail starting at the producer certifying that that beef is free of BSE? And if a subsequent disease outbreak occurs because of it, then we can instantly trace the signature trail back to the source and seek damages? I can fully understand why NVD’s are not filled out correctly – someone working on a property with little education, cannot understand the paper work. Even I have problems, I think get a person with common sense and put it together so that people can understand this. We need something simple.